What to wear – maybe those rainbow I Dream of Jeannie pants, or maybe that tie dye shirt, or maybe those skinny jeans… so many options! Too bad the outfits are only 8 ” tall. Rats! Thank you 🙂 I had a blast coming up with the outfits – such a great fun! oh, I want to shop in your closet! great idea! Hi Brenda! Thank you 🙂 I really loved your VW bus! What an awesome quilt!! So cute! I love the fabrics and colors! Hi Tricia – thank you 🙂 I really enjoyed looking at your website! I love that Robert Kaufman piece you have on the back of your friend’s quilt! Hi M-R! Thank you 🙂 I am going to have my daughter show me how to add the TGIFF button to my website! I love being able to look at all the other link-ups, so many wonderful quilts out there. Your quilting is amazing! Loved looking at the piece you showcased this week. Hi M-R – thank you! I am going to have my daughter show me how to add the TGIFF button to my website 🙂 What a fun link-up you hosted! So many beautiful quilts to see up close. I also loved the quilting project you showcased this week – beautiful! This is fabulous! Those are my kind of colors and my kind of outfits! What a lovely piece! Oh this is so fun! It made me laugh out loud. Thanks! Creating those outfits made me laugh a lot too! Hey! I think I found my missing pajamas! Those are some incredible outfits! What a bright and fun quilt! Hi Lorna! Thanks! Hee-hee…your comment cracked me up! Thanks Diana! I sure had fun creating crazy outfits! This is such a fun quilt! It certainly made me smile. 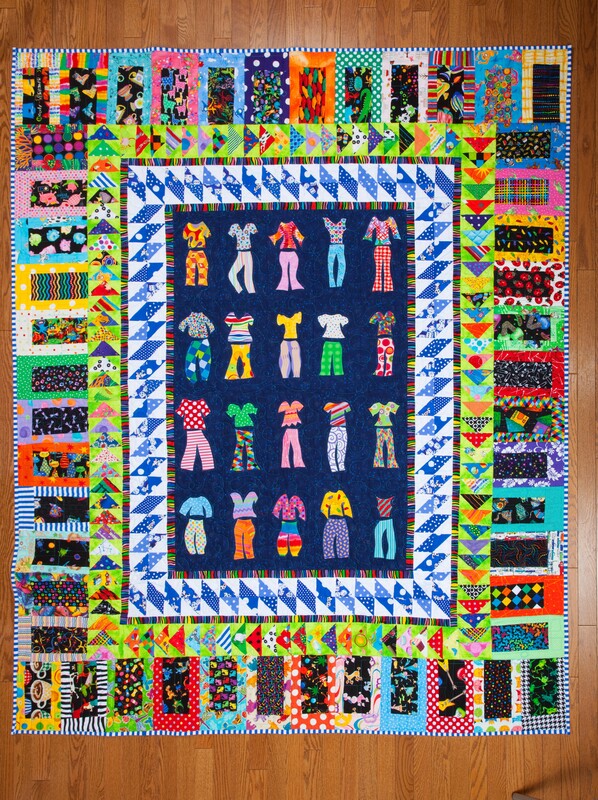 The outfits are each so different, and that makes the quilt so interesting to look at! Thanks so much for sharing at Needle and Thread Thursday and welcome to the party! So darn cute. I would wear anyone of those combinations. Your creativity knocks my socks off! Just so you don’t think I’m crazy or stalking you, I do know that I left two previous comments. But that quilt just deserves being looked at several times, if not more! I really did have a blast making this quilt. I also tried once (and only once) to make an outfit that was closer to 12″ tall. Oh my gosh what a funny disaster that was! Since I was just freehand cutting with scissors, the larger size accentuated all of the irregularities and imperfections. It looked so bad that I tossed it. The smaller size is very forgiving to look at – the mistakes just look small too 🙂 I was so surprised that the scale made such a big difference. Anyway it was a good experiment 🙂 Have a great day!